WAVERLY, WV--A lot of the terms that horse people use have been misused and overused to the point that they are no longer meaningful. Because the term means different things to different people, it is more apt to be mythunderstood than it is to be helpful, especially in a training situation. Saying that a horse is on the bit is one of those terms. As a horse gets near the top of the training tree, we like to talk about him being on the aids rather than being on the bit. * Is muscularly connected from his hocks through his back and neck to the bit because the riders whole circle of aids is closed. 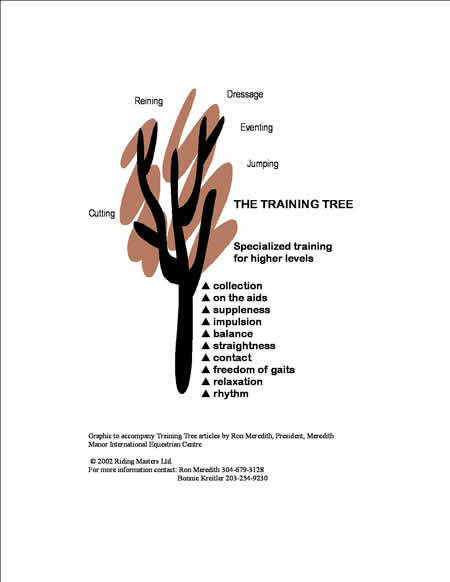 Remember that at the very bottom of the training tree, we started out asking the horse to move with rhythm and relaxation. As he moves up the training tree, we dont want him to lose those basics. As we get closer and closer to where hes going to be at the top of his game, were making a lot more physical demands on him. If weve taken the time to bring him up through all the in-between training levels, methodically developing his body as well as his mind, hes still going to be rhythmic and relaxed as he reaches the top. Resistance means that the horse has lost that basic rhythm and relaxation. Youll know hes lost it if he goes around with his mouth open, or his teeth grinding, or his ears pinned, or his tail swishing, or some other indicator that hes uncomfortable about something. The trainer needs to back down the training tree until she finds the place where the horses comfort turns to discomfort, solve the problem, and work back up from there. When we talk about a horse responding instantly to the aids we really mean that the communication between the horse and rider is so subtle its basically invisible. Sometimes people talk about a horse being obedient to the riders aids. Thats a mythunderstood term, too. Obedience implies things like dominance and subservience. It makes it sound like communication is a one-way street. The rider tells the horse what to do and the horses job is to do it right away. A lot of people ride with this attitude. Communication between the horse and rider should always be two way. When the horse was a baby green learner, we made sure that we first showed him what we wanted him to do. When he understood that, then we could ask him what to do. When we were sure he understood what we were asking, we could tell him what to do, or reinforce our asking, if he didnt respond to our aids. To get that invisible connection, the rider has to ride stride by stride by stride and keep her focus on her horse now and now and now. When a horse is on the aids, the rider asks, the horse listens, the horse responds, and his response gives the rider feedback about how to apply her aids at the next stride. So invisible obedient to the aids is as much the riders responsibility as the horses. It isnt just about the horse being obedient and doing whatever the rider told him to do. The rider also has a responsibility for making sure that the horse has a muscular connection from his hocks through his back and neck to the bit. In order for the horse to give her that response, she has to make sure her whole circle of aids is closed. That means that shes coordinating her seat and weight aids, leg aids, and rein aids so that none of the horses energy leaks out anywhere. Hes using all of his body with just the right degree of muscular tension to correctly take the shape shes asking for at the speed shes asking for stride by stride by stride. Being on the aids is hard work for both the horse and the rider. If you ride an advanced level horse for 40 minutes youre not likely to have him on the aids that whole time. But as the horse comes farther along in his training and as your partnership with him develops and your communication becomes more and more sophisticated those moments when you and the horse are 100 percent in sync will come more and more often. Thats the sweet spot that makes all the hard work up to this point worth every minute. Its that quiet thrill when, even for just a few moments, everything is perfect. Good training is boring. When the rider is keeping everything relaxed, everything consistent, everything logical it looks like nothing is happening. A lot is going on between you and the horse and its probably not all that boring for you as you work with him. But someone watching oftentimes isnt seeing a whole lot happening. And maybe it can even be a little boring for the trainer whos starting his ninety-fifth young horse and hes just kind of waiting for it to come along and theres not much satisfaction yet. Then comes one of those moments when everything comes together and you feel like all you have to do is think something and the horse understands it. Thats what it feels like when a horse is on the aids.